The Epicor ICE 3.2 Tools are the data gathering and monitoring tools available within Epicor ICE framework. These tools are primarily intended to used by managers responsible for fine-tuning their departmental use of the Epicor ERP application and for advanced users wanting to manage and display key data for their specific needs. 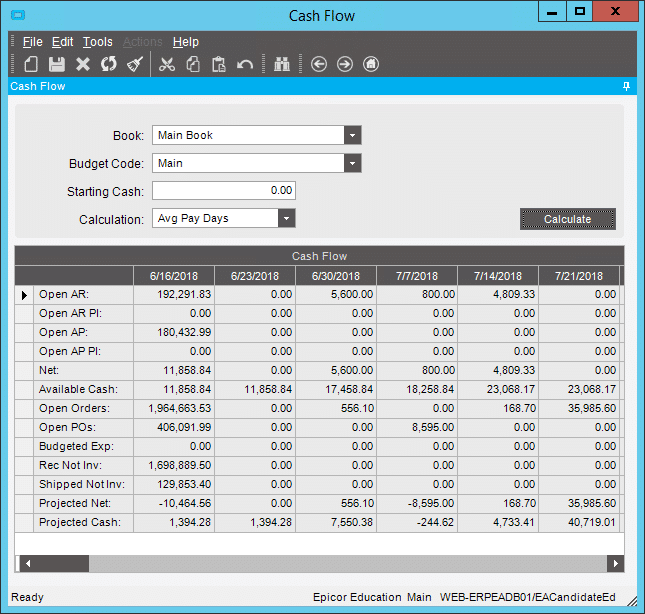 To the right on this page is an example of a Tracker or Dashboard for staying on top of future cashflow projections. To create Business Activity Queries (BAQ), use the Business Activity Query (BAQ) Designer. With this designer you can create personalized queries or to copy system queries so you can modify them. Queries can be accessed in different ways throughout the Epicor ERP application. Queries can be used to generate Reports, included in application Searches, displayed and updated through a dashboard and mobile devices. BAQ execution results can also be exported as .xml or ASCII files, so you can edit their data in third party applications as well. The functionality has some security options, as you can create queries only available for your personal use, or create shared queries available to everyone within your company. Use the External Business Activity Queries functionality to create a connection to external (non-Epicor) data sources. This feature is based on accessing external data via ODBC connections and provides the mechanism for retrieving, updating and displaying information from an external database using the SQL language. Working with external data source looks similar to ordinal query design and execution. The data you retrieve using the external query can be used in additional dashboard renderings, like dashboard applications, mobile framework, Epicor Sharepoint Publisher and so on. To use the functionality, you need an ODBC connection to an external server configured on the machine where the application server is hosted. This connection must also be specified when you create the query. Through the External BAQ Designer, you can browse and select tables from an external data source in the same way as when data is pulled from the Epicor database. Establish a connection to an external datasource using the ADO .NET DB provider available on the machine and compose a connection string to access the external database management system. Set up security restrictions to schema and data coming from an external datasource. Modify external datasource metadata specified in the source database as required. Enable the external datasource you create in the company you work with. Build an external Business Activity Query and use it as a datasource for reports, dashboards, trackers and so on. Expose the data to users using the Epicor Everywhere™ Framework tools. Use the BAQ Report Designer to turn a Business Activity Query (BAQ) into a SQL Server Reporting Services (SSRS) report. You create a personalized BAQ through the Business Activity Query Designer. You then use the BAQ Report Designer to select the BAQ as the base for a report, and to define the option fields, filters, and sort by options that appear on the report interface. The reports you create through this tool are flat reports, which means they only pull data from the table(s) defined on the selected BAQ. If you need to pull data from multiple queries (and so multiple tables), use a Dashboard report to expand the amount of data to include. Dashboard reports are discussed in the Dashboards chapter. To design and format the report, you use either Microsoft SQL Server Report Builder or Crystal Reports (provided for backward compatibility with older reports). Once you complete the report layout, you can add it to the menu for users to access. Then launch Report Style Maintenance to create a report style or styles for it. The style determines which companies can access the BAQ report and other key options. You can also design a routing rule for each BAQ report. Routing rules help you streamline reporting for specific business needs. They can be simple rules that define an alternate report style users run when they need to print a report using a unique format, or complex rules that divide, or break, the report run into multiple dataset partitions which they can link to separate rendering workflows for generating, printing, previewing, and sending the report output. Search programs are available throughout the application. The standard searching tools enable you to easily locate and organize records using filters and specific criteria. In addition to the standard searches, you can also create your own specific searches to quickly and precisely locate the information you need, where and when you need it. Tools are available to modify search programs. Quick Searches are customized search programs you can create from Business Activity Queries (BAQs) that pull in unique search results. BAQ Searches leverage BAQs to locate search results. Advanced Searches are set up within a smart client dashboard; they contain specific fields you can use for defining the search results. Use Data Tag Searches to find records grouped together through a specific data tag definition assigned to each record. Create Named Searches that use the default options you want when the search program is launched. The Enterprise Search is a separate search application you can use to retrieve structured content, like sales orders, jobs, AR invoices from your Epicor database. Method Directives – applied to business object methods. Data Directives – applied to database table transactions. Updatable BAQ Directives – applied to business activity query methods that can update the database. Use the BPM tools to add or change application processes when a business object method executes, when a transaction changes are applied to a table, or when information is retrieved or posted by a business activity query. You do this by creating directives that can evaluate the data being processed, and perform actions based on this data. The Custom BPMs module contains actions that address typical business needs, you may have additional requirements specific to your organization or industry. To handle these unique situations, you can customize BPM method, data, and updatable BAQ directives. You can customize BPM through the Execute Custom Code action. When you select this action, you can enter C# code through a code window, validate your code, and then enable the directive. When conditions on the directive are met, your custom code runs, insuring data entry matches company requirements, displaying warning and information dialog boxes, populating default data, and so on. If you need users to enter custom data as part of a BPM requirement, use the BPM Data Form Designer. Through this program you can create a custom data form that includes text fields, radio button options, drop-down lists, and buttons. You can also secure this data form by requiring users to enter a password. This data form is then launched through an action on a directive. When the directive activates, the data form displays and users enter the data you need. To complete the customization tools, you can create custom external methods and Service Connect workflows. The BPM functionality generates a code shell for your custom VB.NET or C# method, and then you can access this shell within Microsoft® Visual Studio® to create your external method. Once your external method is compiled, you can select it on a directive action. Through this same functionality you can also create a Service Connect workflow that links the data generated through the directive to Service Connect. This data is then available to other Epicor or third party applications. Global Alerts are messages you activate to help specific users track data activity. Standard Global Alerts are pre-defined alerts you activate in Global Alert Maintenance. For a selected alert, you can choose options for enabling the alert, sending email messages, and adding memos to the record that triggered the alert. Enabling memos helps build a database history for the record. An active standard global alert writes alerts to the AlertQue table in the application database. To enable email alert messages, you must set up and activate a supporting Business Process Management (BPM) data directive that monitors the AlertQue table and sends alert email messages whenever a row is added to the table. Since all standard global alerts write to AlertQue, this BPM data directive sends email messages for all active standard global alerts that have the Send Alert option enabled in Global Alert Maintenance. Custom Global Alerts – Alerts you set up through BPM data directives. In the data directive, you determine which table/column you want to monitor, the table condition that triggers an alert, the custom message sent in the email, and who receives the custom global alert. Email alert messages for both standard and custom global alerts can be configured to include a shortcut.sysconfig file the message recipient can use to launch the Epicor application and display the record that triggered the alert. By using both standard and custom global alerts, you can set up a complete automatic communication system. Individuals throughout your organization could then be better able to respond to and resolve customer, supplier, and internal issues. Dashboards are flexible, powerful tools that provide easy access to critical information in a real-time environment. In addition to the standard dashboards included with the application, you can also create custom dashboards. Custom dashboards can replace the need for workbenches, trackers, ShopVision reports, ad hoc reports, and even simple business intelligence reports. You can think of a dashboard as your personalized information and command center. Much like your car’s dashboard gives you current information and controls to run the car, the dashboard displays the current information and processes you need to more efficiently perform your tasks. The data you choose to display can be refreshed automatically or manually, so you can act on changes as they immediately occur. Dashboards display data through business activity queries (BAQs). Several display options are available to present data. For example, you can present data in a grid, chart, or gauge. You can add a Tracker View (to display an advanced search) where you define the fields by which users can search data. You can also add a URL link to display web pages or web parts in the dashboard. Through the Updatable Dashboard feature set, you create customized views of the data that users can then update through a dashboard. Updatable dashboards are useful when you need to update a subset of data on multiple records at the same time for items such as customer contacts, MRP parameters, discount percentages, and so on. When you use an updatable dashboard for these targeted data entry tasks, you avoid opening these records individually through the base entry forms. To use this functionality, the first item you create is an updatable BAQ. You set up this BAQ in the same way as described in the Business Activity Query chapter by linking tables, creating subqueries, adding filters, and calculated fields. You then activate the updatable functionality and link this query to an UpdateExt business object method. Users can then update the database through this BAQ. You can place updatable BAQs on smart client dashboards, Epicor web access dashboards, and SharePoint dashboard web parts. After you add these dashboards to the Menu, they become custom data entry programs users can launch to both review current data and make any updates they need. Optionally, you can also use updatable BAQs on mobile device dashboards. Once you create a mobile dashboard that contains an updatable BAQ, users run this custom entry program on an iPhone or other supported mobile device. Users enter data through the mobile device, directly updating the database wherever they may be. In order to build mobile device dashboards, you must purchase a mobile device dashboard license from Epicor. To complete this functionality, you can monitor the data users enter by creating updatable BAQ Business Process Management (BPM) directives. As users enter data through an updatable BAQ, you can set up Updatable BAQ methods that validate whether the data entered is correct, send email alerts, or cause other processes to run. Use the Executive Dashboards functionality to display real-time, complex views of data. You can use this toolset to create virtual tables that combine, or aggregate, information for quick retrieval and display. For example, this functionality is ideal for viewing sales first by month (a monthly bucket) and then by customer. You could create a Business Activity Query (BAQ) that gathers every order detail record for each customer; this creates a single sum of the calculated revenue – like 50. Through an executive dashboard, however, you can immediately display both the customer information and the revenue by month. This information is retrieved significantly faster than through the standard BAQ functionality. You do this by creating executive queries. You use these records to create virtual cube tables that consolidate the information. Each cube table uses a dimension pair to both pull and then combine the data. You then display the results in a dashboard. Using another example, you need to look at revenue from a project that includes both field service sales and product sales. By using cube tables, you can populate an executive dashboard’s data by running both queries, one after the other, to first consolidate and then view the final revenue numbers. When you measure this data through executive queries, you can get a global representation of nearly every aspect of your organization’s current business flow. This chapter walks you through how to create an executive dashboard and then release it to your users. Epicor Data Analytics (EDA) is fully integrated with Epicor 10 and uses data to help distributors understand their business better, with function-specific content packs that provide a dashboard with deep integration into a specific set of Epicor 10 data-sales, purchasing, inventory, general ledger, accounts payable, and accounts receivable. Common databases in Epicor Data Analytics (EDA) are sales, purchasing, inventory, finance and general ledger, but you may see different databases depending on your setup. Each database is populated with raw data from an ERP or other business system and data is most commonly refreshed overnight. Your source data is not affected by anything you do in EDA. Administrators with permission can create new databases using database designer. Use the Epicor Social Enterprise to communicate with other Epicor Social Enterprise users through actions, such as posting and receiving messages, choosing to follow another user’s message stream, and joining groups. Repost – Re-send with opportunity to change recipients or edit the message. Recommend – Indicate your support. Replies – Display all of the previous replies in a thread-like way. Conversation – Load the previous conversation and highlight the location of the message in it. For this action to display on a message, in the column header, click Toggle Conversation View. Attachments – Access any files attached to a message. Share – Forward a message via email. Use private messages and private groups to take communication with other Epicor Social Enterprise users out of the public message stream. Private message postings are viewable only by the sender and recipient and are not seen by their followers. Use external groups to bring together external users outside your organization with selected Epicor Social Enterprise users into a private group conversation. Only moderators can create and own external groups and invite external users to these groups. This section describes how to add a moderator account in order to invite external users, create a private external group and, and how to join and communicate with an external group. You can design Business Process Management (BPM) method directives and data directives to include automated posting of notification messages to Epicor Social Enterprise. In Epicor Social Enterprise, a notification profile must exist for the Epicor ERP application database table on which the directive is based. In the Epicor ERP application, there must be an active connection to the Epicor Social Enterprise website. In the Epicor ERP application, the Method Directive or Data Directive Maintenance program and the BPM Workflow Designer are used to create a directive that includes a Notify Me action and the action(s) that trigger it. In the Epicor ERP application, the first time the directive triggers a notification, Epicor Social Enterprise receives the request and attempts to match it to an existing notification profile and rule. When a matching rule is found, it is updated if necessary. When no matching rule is found, a new rule is created. This ensures a notification profile and rule are available for users to select when following notifications. In Epicor Social Enterprise, users must set up and begin following a notification based on the notification profile and rule. Notification messages are posted to the Epicor Social Enterprise message stream whenever the directive’s Notify Me action is triggered. Users see those messages in their My Stream column if they set up and are following a notification. Users can set up to follow notifications and monitor their My Stream activity either by logging directly into the Epicor Social Enterprise website or by accessing Epicor Social Enterprise from within the Epicor ERP application client.